Newsletters - Deckadance 1.5 DJ Mixing Application - RELEASED! The latest version of Deckadance, with many new and improved functions, for the best DJ performances is out now! Deckadance 1.5, available for MAC and PC, gains a new audio engine with improved and high quality sound. Version 1.5 now also supports batch beat-analysis of the songs (reducing load times/CPU load during a performance). DJs will appreciate the new playlist design with variable font sizes, view modes and the ability to import iTunes playlists. FL Studio 8.5 public Beta 4 - Available for testing! Check out the latest Beta release of FL Studio, it includes more than 200 updates, bug-fixes and additions. Digital Music Doctor announces the results of the Music Software Internet Popularity Index for First Quarter 2009. During 2009 Q1 FL Studio moved back into the number two position replacing Steinberg Cubase which dropped to third. This index is based on quarterly Internet search activity on Google, Yahoo, AOL and MSN. Collectively these 4 search engines represent more than 95 percent of the searches on the Internet. More about the study could be found here. As FL Studio continues to grow in popularity the whole Image-Line community benefits, with bigger and better Free Lifetime Updates, learn how you can contribute and earn Virtual Cash using your ‘Affiliate link’ here. 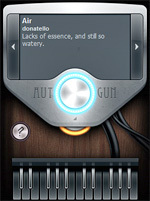 Available for download free of charge, Autogun features more than four billion (4.294.967.296) presets just waiting to be explored for their acoustic potential. Learn more about Autogun here.